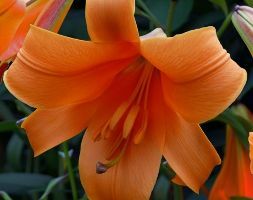 Bulb size: 20/22 Giant-sized, fragrant trumpets appear on the tall, upright stems of this bulbous perennial in summer. A showy plant, which is ideal for adding height and scent to the border. They fit easily into a cottage garden scheme, but will work equally well in herbaceous borders, particularly when teamed with other hot colours.